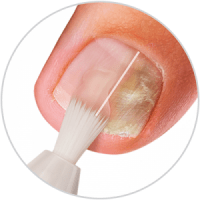 How do I get a fungal nail? How do I get athlete’s foot? When to go to a pedicurist? Taking good care of your feet is an important first step to prevent fungal nail and athlete’s foot! Inspect your feet regularly and pay attention to changes in color, texture and appearance. Take care of your feet; wash and dry off carefully between the toes. Hydrate the skin. Hot weather and open shoes can cause damaged and changed skin, such as chapped skin. 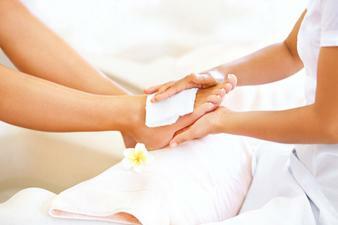 It is wise to regularly moisturize to keep the water balance of the skin of the feet stable. Purchase the right shoe size. The measurements of shoes can differce per shoe brand and producers. It is best to buy the shoes in the afternoon, when the feet are often at their widest size. Always choose shoes that are comfortable. In general we take badly care of our feet. We therefore advice you to inspect your feet on a regular basis, in this way you can detect changes or symptoms. This will allow you to timely respond and treat, for an optimal result. With each complaint to the foot, a visit to a pedicurist can give you insight for the correct treatment option or a referral to a specialist. It is always advisable to seek advice when experiencing any foot complaints. Mycosan is being used by serveral registered practises. Do you consider to ask for advice about your feet ? Please consult the nearest pedicurist. Need some tips or advice? 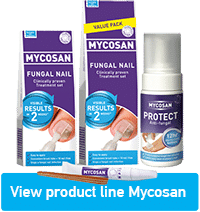 Mycosan Fungal Nail treats mild to moderate forms of fungal nails, it protects surrounding nails against fungal infections and it nourishes the treated nail.